A few months ago, I mentioned in this post that I was deciding whether or not to buy a white slipcovered sectional from Pottery Barn. I think white sofas look absolutely beautiful and it's nearly impossible to mess up a room design-wise when you have a white sofa. Okay, that may be a lie, but flip through a home decor catalog or peruse Pinterest and tell me how many white sofas you see. I was this close to whipping out the Amex and entering my 4 digit code online when I stopped and looked at Baxter sprawled out on the soon-to-be-replaced couch. Ball and all. No regard for the poor scrunched up pillows beneath him. Sigh. He does look pretty cute though, right? I knew that if I bought that white sofa, every day would be a battle with the dog. And I would lose. And I would end up doing umpteen loads of slipcover laundry every week. And I don't do laundry well. Clothes have been sitting in the dryer for 3 days. True story. So I decided to go with something more Baxter-friendly and on a random trip to Boston Interiors, I stumbled upon a charcoal gray sectional with the right dimensions. This I could live with, so I brought it home. The trellis-patterned pillows are also from Boston Interiors, the ivory pillows and rug are from Crate&Barrel, and the storage ottoman is from Ballard Designs. Oh yea, and those are our new windows in the background. They're a little naked right now since I haven't had the time mustered the energy to hang the curtains back up. 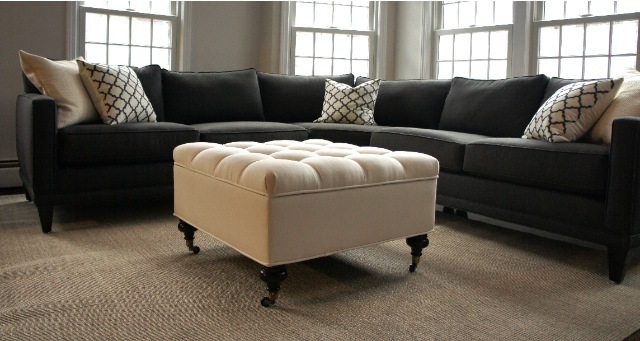 I really love the turned leg casters on the ottoman. 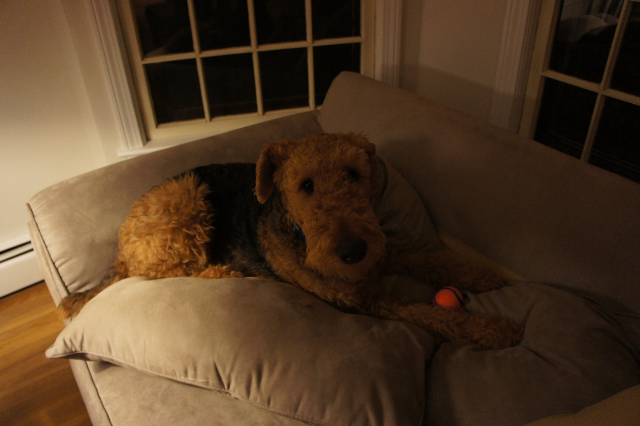 Oh, and don't worry, it's already been Scotchgarded and Baxter-proofed. Here's a view of how the living and dining rooms are open to each other. I've kept the color pallet pretty neutral (grays, whites, ivories, metallics, and natural fibers). I plan to add some pops of color with mustards and maybe corals. 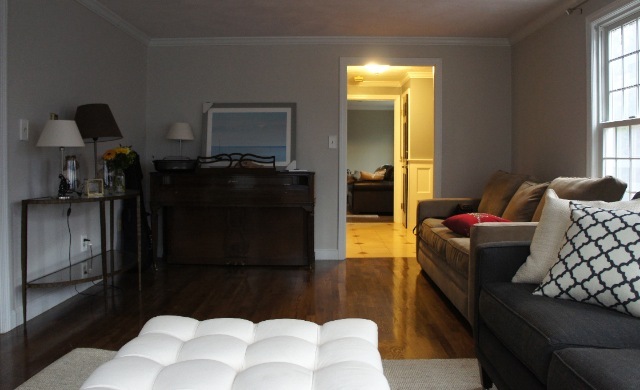 There's our sleeper sofa that's been Craigslisted, a new console table, a graveyard for lamps, random flowers and vases, a piano that was gifted to us by the previous homeowners, and a beautiful Cape Cod photo that my husband's cousin took for us. I'm thinking about moving the piano to the console wall, and then adding floor to ceiling bookshelves were the piano is now. Not sure where the console table will end up. I have two new armless chairs arriving any day. So that my friends is progress at a snail's pace, but I'm feeling more confident things will be finished sooner rather than later. I'm also working on the home office and should have some updates to share with you next week. Have a great weekend! I love love love that sectional and ottoman! They look amazing together! Love the sectional! I'm on the hunt for one for our living room too! I love the new section! It's so pretty. Your living room looks great! I am still jealous of those windows. I just bought the gray velvet sofa I have been wanting. We haven't gotten it yet, but I am slightly worried about what is going to happen with our white dog that constantly sheds. It's going to be a fur magnet...oh well. Hi! I found you through Pinterest. I was wondering if you could tell me where you got your area rug...I've searched your site for the info, but can't find it. Thanks! Hi there! 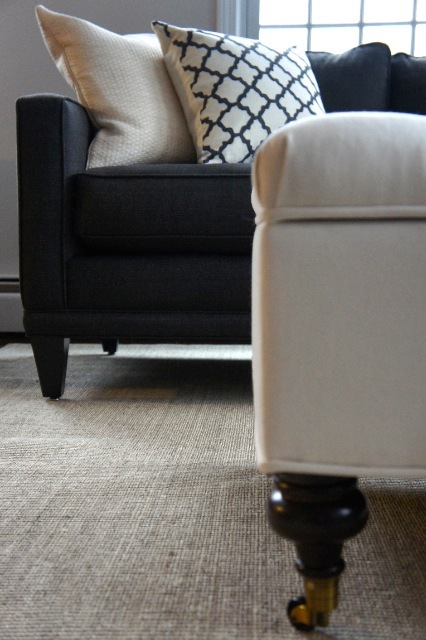 The area rug is the Sisal Linen Rug from Crate & Barrel (http://www.crateandbarrel.com/sisal-linen-rug/f45680). I really like the look of it, but it's scratchy and not super comfortable. It would probably be better in a dining room or kitchen, to be honest. I've thought about layering another softer rug on top of it. Hi there, I got the Twill off-white and I would not recommend it for pets/kids. Dog hair sticks to it pretty easily and it does show stains. However, you can spot clean it. I would probably pick something else a little more kid/pet friendly or with a pattern.